Information should be free/the anti-patent, anti-ownership manifesto. i’m applying for the guggenheim fellowship. it’s due very soon and i’m way behind but the application will be focused around some implementation of the system shown in the tv2.0 doodle above. the doodle currently tells the story in a nicer way than my application but it should change a lot over the next couple days. The Foundation receives between 3,500 and 4,000 applications each year. Although no one who applies is guaranteed success in the competition, there is no prescreening: all applications are reviewed. Approximately 220 Fellowships are awarded each year. So, on to my application. There are 3 main documents I am working on as google docs. 1. A brief narrative account of your career, describing your previous accomplishments. This account should include mention prizes, honors, and significant grants or fellowships that you have held or now hold, showing the grantor and the inclusive dates of each award. http://docs.google.com/View?id=dcpfp46j_145cvg9tcfm I am focusing on my history and accomplishments through 3 directions: artist(music, sculpture, doodles, timelapse), systems engineer(mech eng, robotics, wikipedia/linux analysis), and community organizer(collision collective, radio show, etc). this is something i have thought about a decent amount but never tried to actually write down so it’s slow and needs some work. Publications, if you are a scholar, scientist, or writer. Give exact titles, names of publishers, and dates and places of publication. Playwrights should also include a list of productions. Exhibitions, if you are an artist. Include a chronological list of shows, citing dates and places, and a list of collections in which your work is represented. Forthcoming shows should also be mentioned. 3. A statement of plans for the period for which the Fellowship is requested. Applicants in science or scholarship should provide a detailed, but concise, plan of research, not exceeding three pages in length. Applicants in the arts should submit a brief statement of plans in general terms, not exceeding three pages in length. 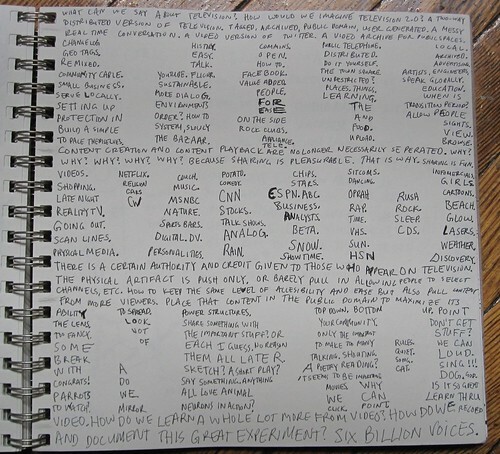 http://docs.google.com/View?id=dcpfp46j_147d62kv727 [UPDATE- i actually just turned in 3 doodles, this is actual pdf submission, http://www.scribd.com/doc/26286341/Paluska-Plans-for-guggenheim-fellowship ] My proposal for the project is focused on the ideas of the broadcaster project, twvee, tv 2.0, 2 way television, open systems engineering, open information channels, public history files through video, and distributed systems. Specifically, the proposal is to openly develop and implement an easily accessible public video booth for the Gowanus Public Housing project in Brooklyn, across the street from where I just moved, my local environment. Possibly this would be a short video version and a timelapse installation? The exact details should not be solidified, only the process, goals, and small steps. The exact form of the installation will be determined by working for a couple months with the local community. see also the broadcaster project proposal to the banff/01sj/sundance locative cinema call. that is viewable here. 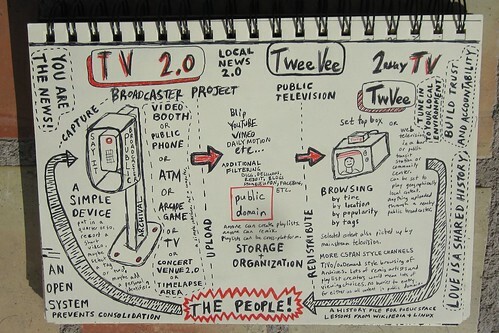 various doodles on the general idea of tv2.0, broadcaster project, local news 2.0, etc in this flickr set. and notes on the broadcaster project.